& hey, the Iso Parachute has half a row in my dry box. WorkHorse- YOU BET! Hey Corndog- you figured out what's being sent out of the jaws yet? Yea, I see that most flys being tied are of a moderate difficulty level, so I'm going to tie the Olive Shellback Scud. Bump...all we need is one more name. You don't have to be an expert..trust me...I'm far from it. My goal is to tie a good simply fly that catches fish and is EASY to tie. I hate losing flies that took me half an hour to tie. In other words... don't expect a beauty from me but a very efficient fly (well, fished properly of course). I know what you mean Karel. Mine is more effecient than quality as well. Just to be sure I tied them right, I think I'll test each one on some trout in the Flatbrook before sending them to DH. On the tag with each fly I'll put "PROVEN - Inspector 9". Tomorrow is the deadline guys and gals. This is your last chance to get in on the fun. Sorry been a bit crazy here in the last 12 hours. Up to 10 and counting. Anybody interested in a Lab pup with a double certified field champion blood line? If 2 more pop out we can use them in the swap. Congratulations DH. 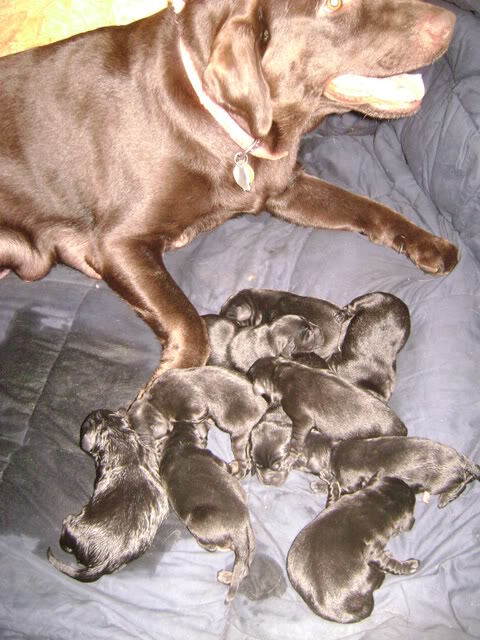 Our black lab, Ursa gave birth last March and your picture brought back memories. Good luck with them.